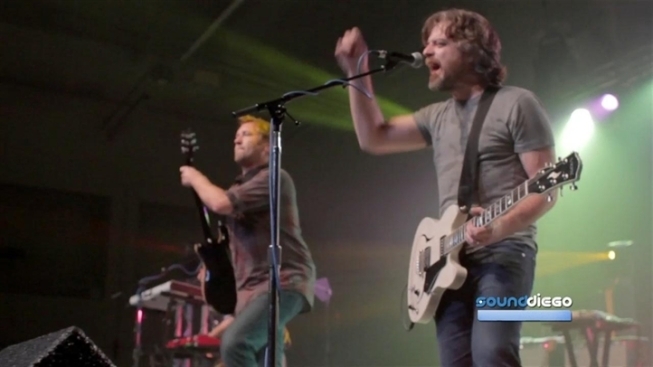 Minus the Bear (pictured) return to San Diego on a bill shared with Murder By Death. Earlier this week, I told you that shows, particularly by touring bands, would begin to slow down, but Saturday is here to prove me wrong. There are so many great shows that the biggest problem will be choosing which one or ones to attend. At the Observatory, Minus the Bear are in town for their Menos el Oso tour. I might be wrong, but I think this will be the largest room Murder By Death has ever played in San Diego, since their shows are almost always at the Casbah or Belly Up, and having them and Aero Flynn as support definitely helps make this a desirable destination for the night. However, We Were Promised Jetpacks -- the lads from Edinburgh -- are at the Irenic for an all-ages show, which will certainly rock. Those of us who came up in the '90s must also feel a little soft spot for Everclear at Music Box, where the band will be celebrating 20 years of "Sparkle and Fade." Holly Golightly is at the Casbah, Dreamers are at the House of Blues Voodoo Room, Steve Poltz is at the Poway Center for the Arts, and Mr. Little Jeans is at Soda Bar. That is some serious stuff to sift through. Maybe you should just roll the dice.